Physicists have demonstrated that liquid water can generate terahertz (THz) waves, by illuminating a thin film of water with ultrashort laser pulses. This is currently being researched for applications such as wireless data transmission, industrial quality control, and high-resolution imaging with the capability for penetration. The researchers, led by Xi-Cheng Zhang, the M. Parker Givens Professor at the University of Rochester's Institute of Optics in New York, as well as at Capital Normal University in Beijing and ITMO University in Saint Petersburg, Russia, have published a paper on the generation of THz waves from water in a recent issue of Applied Physics Letters. The result is surprising because bulk water is a strong absorber of light in the THz frequency range, and so for a long time it seemed very unlikely that liquid water could serve as a source of THz radiation. However, researchers have previously shown, that water can emit light at other frequencies, including white light, and that water vapor can emit THz waves. The key to getting liquid water to generate THz waves, as the scientists show in the new study, is to use a very thin (less than 200 µm-thick) free-flowing film of water. In their experiments, the researchers focused femtosecond laser pulses (which have a duration on the order of one picosecond, or 10-12 seconds) inside the water film. The laser pulses create a plasma in the water film, which ionizes the water molecules, generating free electrons, and eventually emitting THz radiation. Previous research has shown that THz waves can be generated from several other sources, including air plasma. However, the scientists in the new study found that the THz radiation from water exhibits very different characteristics compared to the THz radiation from air plasma. For example, a longer laser pulse duration increases the amount of THz radiation energy generated from water, but for air plasma the opposite is true: a shorter pulse increases the THz radiation. 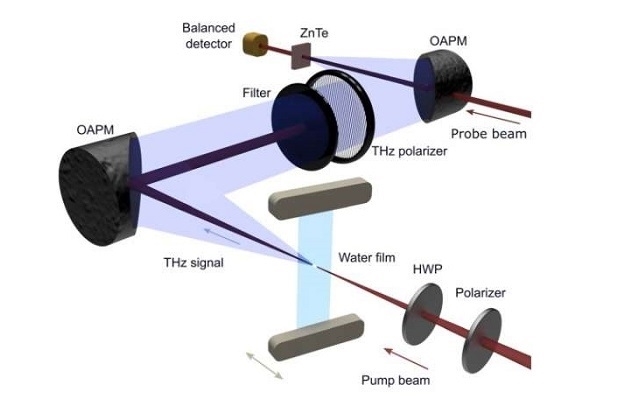 The scientists also found that, when positioned away from the normal incident angle of optical excitation, the strength of the THz radiation from water depends on the polarization of the laser beam, whereas the THz radiation from the air plasma is polarization-independent. The researchers explain that these observations cannot be fully explained by physicists' current understanding of the mechanisms involved in THz wave generation. 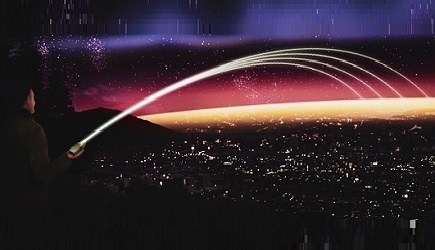 They expect that further investigation of laser-water interactions will lead to a better understanding of the physics behind the new observations, and possibly to new applications. Water is the most important element in the human body and on our earth. Using water to generate THz waves is one step toward understanding the role of water in this frequency range. Previously, researchers tried to avoid water in most THz applications. Now they will likely use water for the generation of intense THz waves. Although it might be too early to predict any industrial or commercial applications for their work at this moment, but it provides the last piece of the puzzle. Solid, gas, and plasma have been used to generate THz waves already, but not liquid. With liquid, especially water, four states of matter have now been used as THz sources. To read the published article, click here.